Offices for the Somaliland Diaspora Agency were unveiled to serve the dozens of thousands of Somalilanders living abroad. The contribution of the diaspora to the national economy constitutes over half of the household income and exceeds the total value of livestock exports. The Minister of Foreign Affairs & International Cooperation also appealed to the diaspora to contribute financially to alleviate the hardships faced by the people of Somaliland. The Somaliland Diaspora Agency (SLDA), under the Ministry of Foreign Affairs & International Cooperation of the Republic of Somaliland, held a highly organized opening ceremony for a newly constructed office which will serve as the Agency Headquarter and situated inside the Ministry compound in Hargeisa. 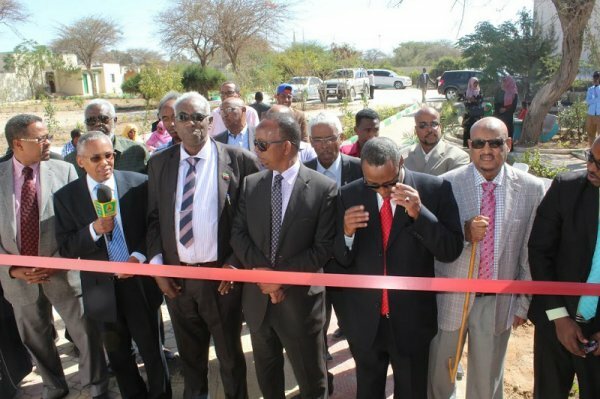 The Minister of Foreign Affairs & International Cooperation, Dr. Saad Ali Shire, cut the ribbon for the official opening of the new office for Somaliland Diaspora Agency, plus other improvements made in the landscape of the Ministry compound. Minister Shire pointed out the vital role of Somalilanders abroad and that they have for a long time remained resourceful contribution to the country’s rebuilding, reinstating, investing and economic development of the country; and that they should not be regarded as foreigners but as the citizens of Somaliland who only for certain circumstances immigrated abroad and are still connected to their homeland. “When it is said ‘Diaspora’ we don’t mean foreigners but they are Somalilanders who only as circumstances we met, went abroad but remaining crucial resource to us. The Diaspora remits back home between $400-$500 million a year and more which even exceeds the income we receive from the livestock export and which constitutes over 50% of the household income particularly in the urban areas. About 70,000 people from the Diaspora come home each year and spend more during their stay. We have built this office to serve those 70,000 [members of the] Diaspora and (…) [others] abroad,” said Dr. Saad Ali Shire, Minister of Foreign Affairs & International Cooperation. On the other hand, the Minister took the opportunity to call Somalilanders abroad to actively and generously contribute to the Relief Campaign for the affected population affected by the current drought and to make efforts to alleviate the difficulties and hardship caused by the latter in Somaliland. Chairman of Somaliland Diaspora Agency Mr. Abdi Abdullahi Hersi (Dayaxweerar), firstly thanking the disguised officials and guests attending the ceremony, explained the challenges undergone by himself and his colleagues to get this new office constructed, the previous absence of adequate office space, and how it finally became possible for the Diaspora Agency to ensure construction of the building. “We have constructed this office with $30,000 the Ministry of Finance allocated to us for purchasing a car in the budget year 2016, but I thought to transfer it to build this office and the Minister of Finance accepted our suggested transfer. It took us a while to implement it as the drought resulted [in a] deduction of [25% of] the budget (…) and [because] (…) the purchases of vehicles and construction works by the Ministry of Finance [was suspended]. However, we asked for Najax Construction Company to build this office for the Agency with $30,000, and they too accepted to implement it with is amount and supplement from their side,” said Abdi Abdullahi Hersi, Chairman of Somaliland Diaspora Agency. The other key speakers in the ceremony included State Minister of Foreign Affairs, Mr. Mohamed Mihille Boqorre, Chairman of UCID [For Justice and Development] Political Party and who is at the same time member and chairman of the Somalis Territories Affairs Sub-committee of the National Recognition Committee, Engineer Faisal Ali Warabe, State Minister of Water Resources, Mr. Mahdi Osman Buuri, Ex-minister of Foreign Affairs and member and chairperson of the European Sub-committee of the National Recognition Committee, and at the same time Director of Edna Aden Hospital, Dr. Edna Aden Ismail, Spokesperson of Kulmiye Political Party, Mr. Hassan Mohamed (Gaafaadhi), Mr. Abdi Abdillahi Aden, an activist from Somaliland Community in Toronto, Canada who spoke behalf of the Somaliland Diaspora abroad and thanked the Minister of Foreign Affairs and Somaliland Diaspora Agency for accelerating efforts in strengthening the Diaspora relations and full reestablishment of the Diaspora Agency Head Office. All the above speakers and dignitaries appreciated construction of the new building, congratulated Somaliland Diaspora Agency and the Ministry for the opening of the office, emphasized significances and worth of the Somaliland Diaspora, their long-lasting contribution to rebuilding economic, social and political development of the country in general. They also encouraged improving all necessary services to the Somaliland Diaspora to ensure better engagement and maximize their contribution to the national development aspects. The other eminent officials from the government, the other national councils and civil society including several members from Somaliland Diaspora, Minister of Justice, Mr. Ahmed Farah Adare, State Minister of Aviation and Air Transport, Mr. Ahmed Nur Fahiye, Chairman of Somaliland Diaspora Recognition Committee in UK, Mr. Aden Ahmed Yusuf (Sawalihi) accompanied with other members of that committee, prominent figures from Kulmiye Party including Ms. Sahra Qaadi, Fadumo Abdi Kahin, Director of Human Resources of the Ministry of Health and Nursing, officials from the National Accountant General, the National Auditor General; Director General of the Immigration Department, officials from other different ministries, and public bodies including Ministry of Finance and Ministry of Planning, Ambassadors of Somaliland to Australia, Yemen and China, local nongovernmental organizations including Sonyo, Havayoco and Shaqadoon, INGOs [international nongovernmental organizations] and UN [United Nations] Agencies including IOM [International Organization for Migration], MPs, over 50 members from Somaliland Diaspora communities in different countries abroad, media groups and other honorable guests. At the closure, to show gratitude and appreciation of their role, Chairman of Somaliland Diaspora Agency, Mr. Abdi Abdullahi Hersi handed honorary and award certificates to the Minister of Foreign Affairs, His Excellency Dr. Saad Ali Shire, Chairman and Deputy Chairman of Najax Construction Company, and one to the Minister of Finance, Her Excellency Samsam Abdi Aden, who was away but the Minister of Justice received on her behalf. The Chairman of the Diaspora Agency was awarded with an honorary certificate by his Agency team of staff and his colleagues. It is also noteworthy to mention that the Diaspora Agency distributed printed copies of the Achievement Report for 2016 also including encountered challenges; suggestions from the Diaspora people and recommendations for the new action plan for 2017 and beyond. Somaliland Diaspora Agency is greatly thankful to all those illustrious and honorable guests who attended this ceremony – both those mentioned above and the ones we have not named in this statement including the members from Somaliland Diaspora, the other nationals, both officials from governmental and nongovernmental institutions as well as the esteemed media groups who attended and all those who will publish. We have invited all the three national political parties in equal number but unfortunately Wadani Party did not show up.